In order to properly identify edible shrubs ensure you are familiar with your region’s plants or take real good memory photographs for when you’re in the wild and hungry. You might even consider having a few of these plants in your garden, as an extra food source if the need should arise. Janet over at ouroneacrefarm.com shares a list of 10 Shrubs for a wildlife-friendly, edible landscape. Acorns of oak shrubs are prized by many of the same animals (both mammals and birds) that eat acorns from oak trees. But because acorns on shrubs are closer to the ground, they are more available to terrestrial mammals and birds of the shrub layer. Exact species which use oak shrubs depend on which oak and which geographic area. Birds that nest in the shrub layer might choose oak shrubs to raise their young. Oaks are a superb choice for supporting native insects. Larvae of a huge variety of insects use them, depending on species. For example, Q. ilicifoliais the larval host plant for the sleepy duskywing moth and the eastern buckmoth. Acorns are high in protein, carbohydrates, and fat, providing excellent nutrition. Acorns are edible by humans after the tannins have been leached out. The nut meats can be ground into a meal or flour, and used for breads, muffins, etc. While some of the European and Asian hazels grow as trees, the two hazels native to North America grow as shrubs. The nuts are outstanding for both human and wildlife consumption. You can forage for wild nuts, but if you want to eat a lot of them, it’s best to plant some in your yard and leave the wild ones for wildlife. Many mammals covet the sweet and delicious nuts. Larger birds which can open the shells, such as jays and woodpeckers, relish the nuts. Grouse eat the buds and catkins. Woodcock and other small animals use hazels for cover. Corylus species are an excellent food source for bees. While the plants are actually pollinated by wind, bees enjoy the pollen. 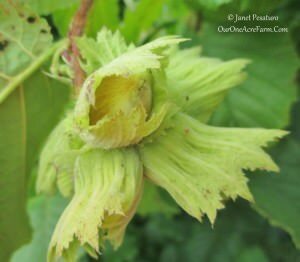 The nuts are sweet and delicious, husks are easy to remove when dry, and shells are easy to crack. Many mammals and large birds, such as turkeys, jays, and woodpeckers favor the nuts. It provides excellent cover for wildlife. Larval host plant for the Orange-tipped oakworm moth. The sweet nuts are small but delicious. Berries of most viburnums are not top menu items for birds, but some, such as highbush cranberry, persist through winter, providing emergency nutrition when food is scarcest. Viburnums are larval host plants for spring azure and common blue butterflies. Be aware that although American cranberry bush has sweet berries, its European look alike (V. opulus) has extremely bitter berries. Unfortunately, some nurseries sell V. opulus as American cranberry bush. Berries have different uses, depending on species.